Here’s what you need to know about fire-rated glass and framing applications to get started on your next project. Where Can I Use Fire-Rated Glazing? Fire-protective glass like TGP’s FireLite® family of fire-rated glass ceramic is available with up to 90-minute fire ratings for use in openings, including windows, sidelites and transoms. Such glass defends against the spread of flames and smoke, and is suitable where protection against heat transfer is not required by code. If the fire-rated window, sidelite or transom is included in a door assembly or storefront system that is required to meet temperature rise criteria, fire-resistive glass like TGP’s Pilkington Pyrostop® is a code-approved option. 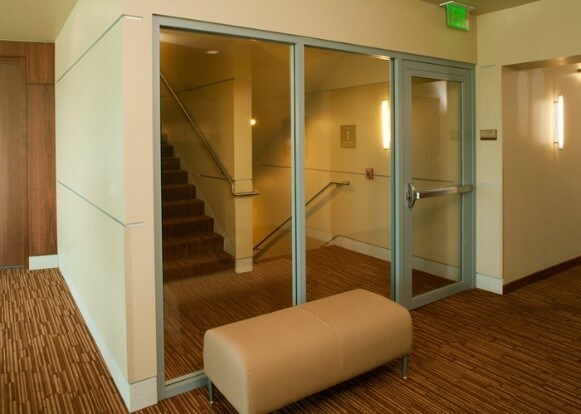 Fire-protective glass (glazing that defends against the spread of flames and smoke), such as TGP’s FireLite fire-rated glass ceramic, is available with 20 to 180 minute fire ratings for door assemblies. It can often be used in the maximum size (as tested by an independent testing agency) in fire-rated doors depending on the required fire rating. However, in some cases building codes limit fire-protective glass to 100-square inch lites in doors with temperature rise requirements, such as those in exit enclosures and passageways. 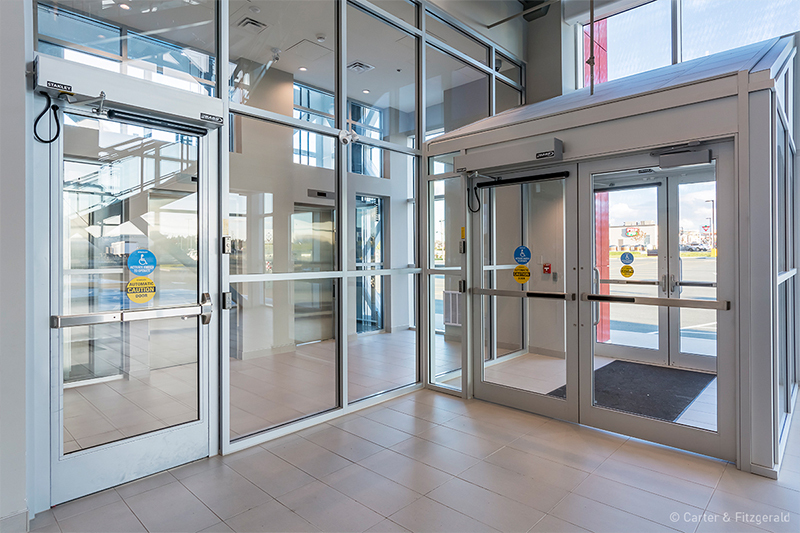 If the design calls for a full-lite glazed door to boost visibility, improve wayfinding or create a bright, open entry, a code-approved alternative is fire-resistive glass, such as TGP’s Pilkington Pyrostop fire-rated, impact safety-rated transparent wall panels. Since it can defend against flames, smoke and heat transfer, it is not limited to 100-square inches, even in doors with temperature-rise requirements. There are also a number of compatible fire-protective and fire-resistive door and framing systems that are available in single leaf or double leaf design. Products like TGP’s Fireframes® Designer Series, Fireframes Heat Barrier Series and Fireframes Hardwood Series not only provide a sleek, modern alternative to traditional hollow metal steel frames, but are also available in a wide array of colors, materials, and finishes. Their design flexibility helps prevent scenarios in which the fire-rated frames provide the necessary fire protection, but the frame color and material conflict with neighboring door, window and curtain wall applications. With their ability to be used in unrestricted glazing areas in locations where the total glazing exceeds 25 percent of the wall area (for 60- and 120-minute applications), products like TGP’s Pilkington Pyrostop fire-rated wall panels are ideal for storefront applications. Such fire-resistive glazing defends against the spread of fire and smoke, while also providing a clear and unobstructed view into buildings. 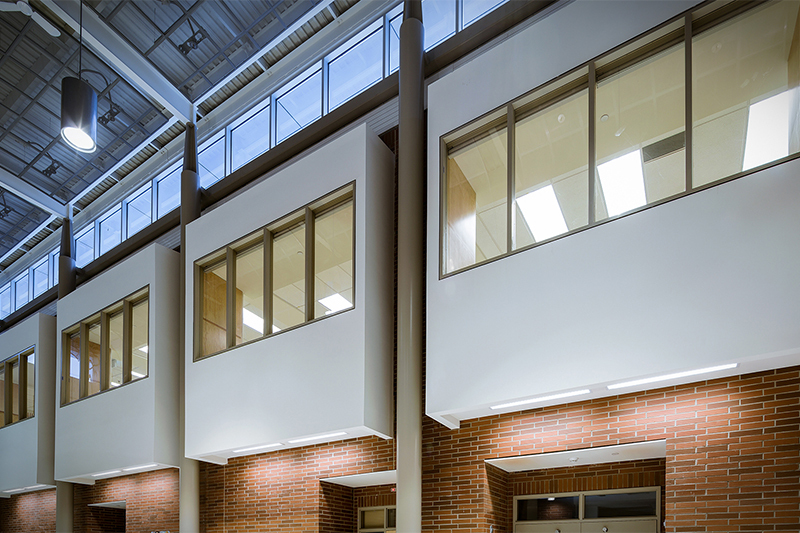 Such glass is compatible with TGP’s Fireframes® Designer Series, Fireframes Aluminum Series and Fireframes TimberLine Series fire-rated frames, enabling storefronts with sharp edges and narrow sightlines. In these applications, it is typical to use multi-laminate, fire-resistive glazing, like TGP’s Pilkington Pyrostop. Such glass provides nearly the same level of clarity as ordinary float glass, carries fire ratings up to 120 minutes, passes the fire and hose stream tests and offers up to Category II impact safety ratings. It also provides a barrier to heat, enabling it to pass the test standards for solid walls and exceed 25 percent of the total wall area. When paired with fire-resistive frames, building teams can use such glass to create large expanses of see-through fire-rated walls in areas that would otherwise require concrete, gypsum or other opaque fire-rated materials to meet code. Given the many design benefits of transparent fire-rated glass wall panels, new combinations of fire-resistive glass and framing are constantly entering the market. For example, modern fire-rated curtain wall systems like TGP’s Fireframes® Curtainwall Series and Fireframes Aluminum Series feature well-defined corners and crisp edges for smooth integration with surrounding applications. Fireframes TimberLine™ Series makes it possible for design teams to create fire-rated transparent wall panels with the heralded beauty of wood. 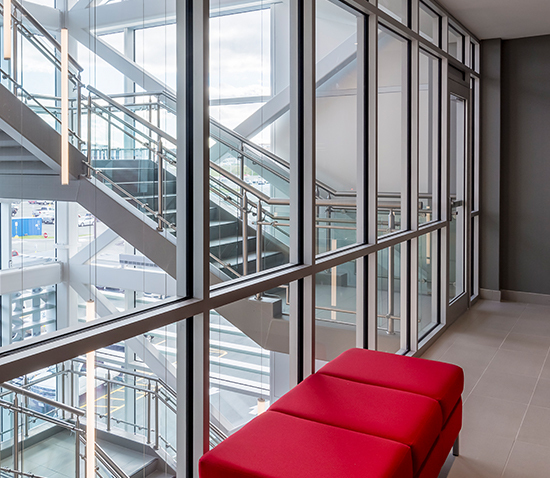 Recent developments, such as the Fireframes SG Curtainwall® Series and Fireframes ClearView® System take innovation one step further, enabling fire-rated glass walls with a seamless glass aesthetic. Due to recent innovations, design professionals can now select fire-rated glass floor systems like TGP’s Fireframes ClearFloor® System for horizontal fire separations. These multifunctional systems can support demanding loads, act as a light-transmitting device, and defend against flames, smoke, and heat should a fire occur. Products are available with fire-resistance ratings up to two hours for interior applications. Additionally, some manufacturers offer glass floor color and texturing options to support aesthetic goals while maintaining adequate slip resistance and daylight admission. 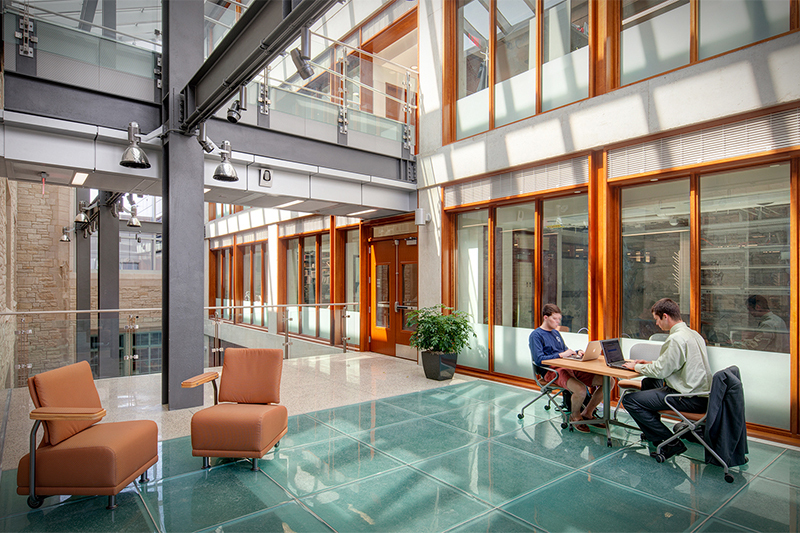 Popular uses for fire-rated glass floor systems include lobby floors, atriums, corridors near exits, and other public egress areas at risk for fire progression, as well as for walkable skylights that transmit light deep into a building’s core.